Learn Acoustic Guitar The Right Way, Right Now And Save Yourself Years Of Wasted Time And Endless Frustration. So you want to learn how to play guitar, but you don't want it to take forever. You want to know how the great acoustic guitarists play (and create) such incredible music, but you don't want to be constantly frustrated every time you pick up your guitar to play. You are willing to put in the time & effort to learn guitar the right way, but only if you are not going to be wasting your time on boring exercises or practicing things that don't work. You are smart enough to know that the easiest, fastest & best way to learn how to play and master the acoustic guitar is to learn from an experienced guitar teacher with a winning track record of teaching people like you to become excellent musicians, but you are also smart enough to know the difference between people who simply call themselves experts and someone who actually is one. If I've correctly described what's been on your mind lately about learning to become an awesome acoustic guitar player, then you're in the right place. You should learn from as many different sources as possible. You should seek to always learn something new. You should master what you learn before moving on to something else. You should teach yourself in order to save money. You should take private in person acoustic guitar lessons to learn best. You can learn from any guitar teacher, they all teach the same basic things. You need to have natural talent in order to become a great guitar player. You need to practice hours and hours per day to learn how to play acoustic guitar well. Learning from as many different sources as possible: On the surface it may sound good to learn from many sources. However, in reality it's usually not. Why? Because your goal is not to simply acquire information, it is to become an excellent acoustic guitar player. To best do that, you need not only the tools but also a process to get there. When you take little bits and pieces from many different sources, you lack a proven process to achieve what you want to achieve. Therefore, it's far better to rely on one great source of information, lessons, training and process than to randomly collect information from lots of different sources. Always seek to learn something new: Believing in this myth can be dangerous to your development as a guitar player. Think about it, if all you needed to do in order to become a great acoustic guitar player was to learn something new each day, then all I would need to do to is create a book and sell it to you. We both know that mastering the guitar does not work that way. What does work is being taught what and how to do things and then give you the tools and the process to achieve your guitar mastery. Master what you learn before moving on to something else:Sometimes this is true, but other times this advice can really hurt your guitar playing progress. There are some things you should learn in a linear way and you need to master those things before moving onto the next step in a linear process. However, there are more things that absolutely should not be mastered before moving on to the next step. Why? Because a part of mastering the acoustic guitar is being able to take several things you are working on and tie them all together right now - even before you have mastered any of them. Yes, I realize this may sound counter-intuitive, but I can tell you as a world class guitarist and highly successful guitar teacher that this is a foundational core concept in learning and mastering the guitar (electric or acoustic). Teach yourself in order to save money: You need to ask yourself the following question, "Am I serious about learning how to play acoustic guitar or am I just screwing around here with this guitar?" If you're just screwing around, not serious at all and don't really care about ever playing guitar well, then sure you can do that all by yourself without investing anything into it. But you will become frustrated a lot and it will take a very long time to learn what and how to do things and in some cases you may never learn them even over a lifetime of trying…. Or you can get serious, save yourself years of frustration & slow progress and learn to finally become that guitarist you want to become. Take acoustic guitar lessons from a local teacher: Almost all local guitar teachers (in any part of the world) have absolutely zero education, training nor certification on how to teach guitar. Yes, you will find some that are experienced, but in experienced in what? Teaching things wrong year after year? That's not what you want to pay for. If typical local guitar teachers were so good, the average guitar student would be a lot better than they are. Most students do not develop into excellent players because their local teachers are commonly not excellent and trained teachers. It's that simple. You can learn from any guitar teacher, they all teach the same basic things: Not all guitar teachers are the same. There are many different methods (and lack of methods) out there. 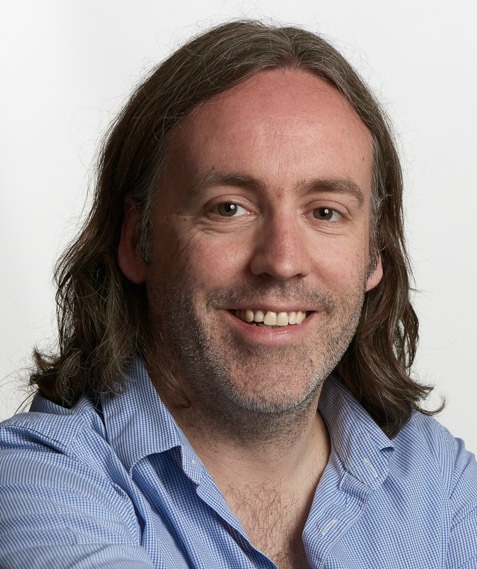 What the very best guitar teachers know that other teachers do not is that it's not just what you teach, but it's also about how you teach, the process of teaching and the specific order in which things are taught, learned and trained that makes the biggest impact on how fast (or slow) you will learn to play guitar well. You need to have natural talent in order to become a great guitar player: This is the biggest and most common myth of them all. No, you don't need to be born with special DNA to learn and master the guitar. Most of the great acoustic guitar players will be the first to tell you that they possessed no more natural talent than anyone else when they were learning to play acoustic guitar. Anyone can learn to play and to play at a very advanced level… anyone. You need to practice hours and hours per day to learn how to play acoustic guitar well: Yes, you need to practice your guitar. No, you absolutely do not need to spend a huge amount of time each day doing so. What you do need are the following things: the right person to guide you, an effective and efficient guitar practice routine and training on exactly how to practice. Hi, I'm Simon Candy. I've been teaching acoustic guitar for a very long time. I have the knowledge, training and expertise to transform the common person into an excellent guitar player. I'm dedicated, passionate and committed to doing the same for you. 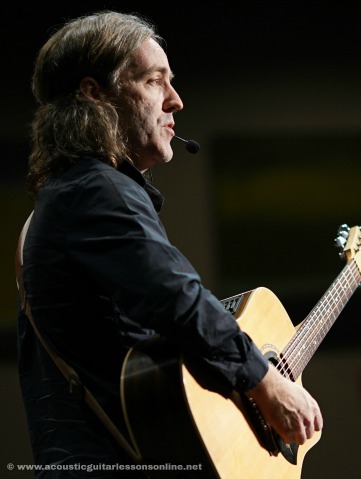 That's why I've created this website and all the lessons and tools for you to get started and complete your incredible, fulfilling and successful journey to becoming the awesome acoustic guitar player you want and will become. NEW! Ever hear an unplugged acoustic version of a song that made your jaw drop to the floor in amazement and awe of the person playing it? Have you tried doing this yourself and failed miserably, realising it takes a lot more than simply taking a song and copying it note for note, chord for chord onto your acoustic guitar? The problem is, if you take this all too common "cut and paste" approach when creating an acoustic version of an electric guitar song, you end up with a dull, boring, and lifeless rendition as your acoustic arrangement. People LOVE to hear a tune stripped back to its bare bones and re-created on an acoustic guitar, bringing a uniqueness to it that only an acoustic guitar can provide. 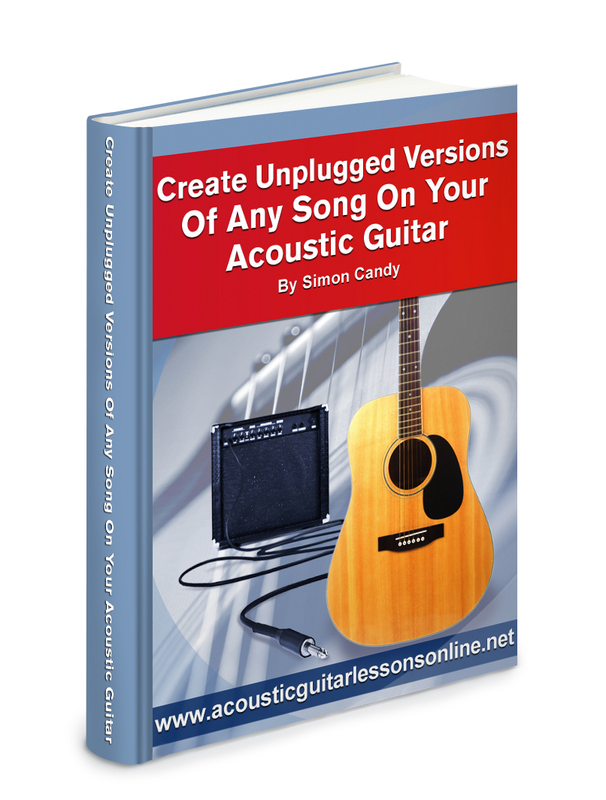 Learn exactly how to go about creating awesome sounding unplugged acoustic versions of songs on your guitar. You will be taken through many cool, unique, and innovative techniques and approaches that will not only have you creating your own awesome acoustic arrangements of songs, but also make you a much better guitar player in the process! NEW! Do you struggle to improvise on your guitar? Do you learn the riffs of your favourite guitar players and get frustrated when you can’t replicate the same music they seem to easily and effortlessly be able to do? Do you run out of ideas of what to play when improvising, and start noodling around aimlessly on your guitar? I know exactly how you feel. There was a time when I would learn a whole lot of cool riffs but become incredibly frustrated when they didn’t transfer into great sounding solos when improvising on my guitar. Learning riffs to solo and improvise with on your guitar is just the very first step. Let me introduce you to the 7 step guitar riff workout that will totally transform your soloing and improvisation skills on guitar. Learn once and for all how to really get the riffs of your favourite guitarist’s into your own playing. BRAND NEW! 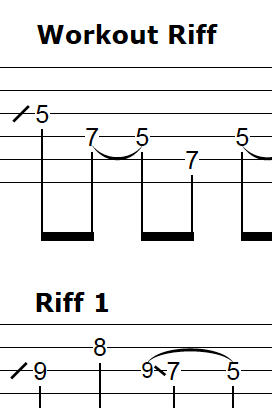 In part 2 of this article series I will reveal to you steps 4 through to 7 of my guitar riff workout. Along with part 1 of this lesson you will have a complete strategy for getting riffs into your guitar playing for good so you can generate hours of incredible sounding music. I will show you how to effortlessly run up and down the fretboard with a single riff, creating variations as you go, easily having the riff fall under your fingers and sounding musical every time. I will also reveal to you the number one reason why people struggle getting a riff into their guitar playing and what you can do about it. It’s all part of the 7 step guitar riff workout lesson, designed to take your improvisational and soloing skills to a whole new level. NEW! How would you like to easily (be able to) create amazing and extravagant sounding music on your guitar using simple chord shapes? Furthermore, how would you like to have the ability to take an average, everyday, been played a million times before chord progression, and have it sound totally out of this world? Watch the video below and I will show you exactly how to do all this in great detail in what is the third and final instalment in the lessons series I’ve created for you on creating with chords on your guitar/guitar chord creativity. 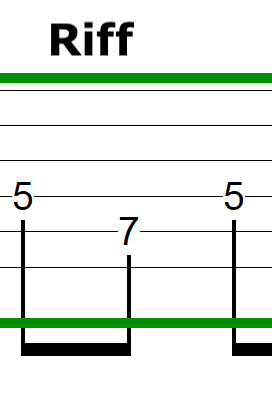 Learn these chord shapes for your guitar playing and watch your chord vocabulary explode!